Future-proof your 8mm and 16mm Films: frame-by-frame in Full-HD instead of DVD! The films have proven their longevity. Now let's talk about digital future-proofing! Not every format is equally suited, however. Those annoying mpeg-typical pixel swarms, which one sees even on HD-TV, may be fine for soap operas, but a proper film digitization shouldn't add such avoidable artefacts. Avoidable, because at today's storage prices, one can follow the lead of museums and archive as high-res as possible. 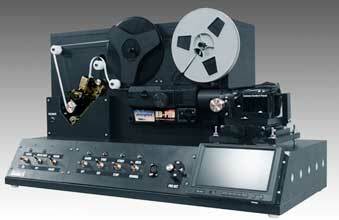 From such originals, one can then export any playback format: DVD, Blu-ray, HD stream, facebook or iPad. For ten years (initially as "kreativeDVD", logo at right) we have been striving for the best possible and still affordable archival solution for 8mm and 16mm films. Therefore, we have always delivered progressive file formats, which our customers are then able to edit and export into any number of playback formats: "We deliver the raw diamonds, you determine the cut!" We were first in Germany, back in 2008, to switch our entire production to 1080p Full-HD. Now, with our decision, to also deliver your films as 100% progressive numbered image sequence, without any video codec, we have once again raised the bar! Obviously, your films are carefully cleaned before digitization. First wet, then dry with a special antistatic tape cleaning system. Splices are repaired as needed. The capture - at the enlarged film stage and from the sharper emulsion side - does not involve any kind of intermediate projection. An LED coldlight source leads to even illumination from corner to corner. While some other serious transfer systems can claim the same, the picture changes, as soon as one includes the following factors. Basically, films are a series of tiny slides, which change quickly enough - just like the thumb theatres of our school days - to fool the human eye into seeing motion. 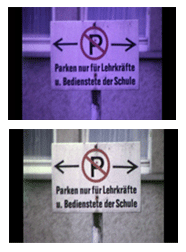 PAL Video achieves the same effect with its video fields. Thus, the crux of any digitial film transfer is, how to turn the 16, 18 or 24 images of a film-second into the 25 fields of a video-second. 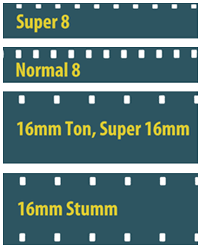 To adjust the playing speed of films, they need to be "stretched", by adding up to nine images per second (lower graphic). This inevitable step is called pull-down or padding. How and when this is done, differentiates the various transfer systems. Real-Time systems - homebuilt or "professional" - leave this extremely important process to a camcorder. Already during capture, the needed fill-frames are clobbered together by means of interlacing, which combines parts of neighbouring frames. These blended frames (in case of a Regular 8 film 1/3 of the total!) become a permanent part of the original files, which with modern playback systems, which often apply de-interlacing, can result in ugly artefacts, as show in the still-frame to the right. An uncompromising frame-by-frame process, which captures each film image individually and maintains them as discrete images right through the process. The most important advantage of our process - used also by the Academy of Motion Pictures Archive in Hollywood - is its brilliant asynchronous capture technology. To assure that camera and projector run synchronously, real-time systems play both Super and Regular 8 films at 16 2/3fps instead of the correct 18 or 16, which eintails a deviation of up to 8%. By contrast, our system runs completely independent of camera, film or projection speed. Like pearls on a chain, each image is first sent to a RAID system. Only then, inside the computer, the critical speed adjustment is made - by means of arithmetic frame duplication. Result: the film runs completely without flickering, at the proper speed and still remains 100% progressive, i.e. each single image is a complete video field. 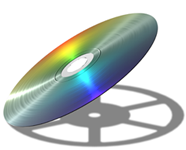 One can, however, also leave the raw files without speed adjustment and regulate playback from inside the media player or later in the editing programme. With complete freedom of choice! That opens interesting creative posibilities and helps, when the original taking speed may be unknown. Moreover, future users of the film archive will be able to use future technological advances in editing and file management, without first having to remove the sins of the past, so to speak. In the age of mega-pixel mobile phones and HD Televison, a Full-HD digitization is the only logical choice! As long as the files can be handled and edited with regular equipment, the rule is: There is no such thing as too much resolution! When scanning, one picks the target resolution. The images of the left column may look equally sharp, but while the lower one represents a 1:1 scan for this size, the upper one is actually a much higher scan resolution, scaled down to fit. When one now enlarges these images (right column), the huge quality reserves of the higher resolution scan become very obvious. With video, it is quite similar. When a 400K SD digitization is played on a 2 Megapixel Full-HD TV, it has to be enlarged - scaled up - five times. In spite of all the nifty scaling algorithms, no enlargement can ever match the resolution of a native Full-HD file! A true Full-HD image consists of 2,073,600 pixels, which must be displayed progressively, i.e. at the same time. A source, which meets these requirements, can be called Full-HD. Our image files do. There are two additional "HD" formats. The first, 1080i, is an interlaced format, which makes it ill-suited for film digitization. The second, 720p, provides less than half the Full-HD resolution. Since there are no 720p TV or computer screen, this format still needs to be upsampled, which naturally involves losses. For stationary use, where bandwith doesn't play an important role, only the move from 576p to 1080p really is a noticible improvement. One digitizes not just single images, but their interaction! If you have ever projected film, you have come across this surprising phenomenon: A license plate or similar object appears somewhat unsharp while shown as a still frame. Yet, as soon as the projector starts running, the screen images are sharp. Why? Were one to record a static object with a video camera, all images would be practically identical. That's, because the recording pixels form a matrix and see the world through a fly screen. The silver halides forming the film emulsion, by contrast, are of random shape, size and location. Each film image, therefore, provides a somewhat different representation, which builds sharpness in an additive and dynamic manner. This becomes particularly noticible in scenes with water or foliage. The higher the scan resolution, the more promounced this effect becomes. The 2 Megapixel 1080p format is able to approach this Film-feeling in a believable manner! Super 16: extended image area (almost 16:9) instead of sound track. Video-Codecs com/decompress large video raw date for specific playback formats, media and bandwidths. There is no allround genius. Interframe Codecs, like mpeg, were designed for playback and compress entire groups of pictures together. Only the first of these is complete. The rest contain merely difference informations and must be reconstructed for playback and/or editing. 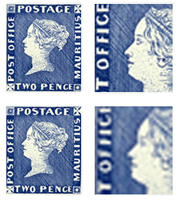 Intraframe Codecs, by contrast, (M-JPEG, DV) compress each image individually and independent from its neighbours. Clearly, such files are ideal for frame-accurate editing and the Digital Cinema Initiative (supported by all major studios) has therefore chosen MJPEG as production and delivery codec. With camcorder and video card manufacturers tending to optimize certain codecs for their hardware and then issuing specific softeware, the fora are already filled with sad tales of incompatibility problems. What is that going to be like in 20 years? Wouldn't it be grand, if one could save the films as single images, without any special codec? An Archive with Future? Many films are 30, 50 or even 70 years old. One can only hope that a digital archive can reach a similar longevity. A simple and relatively uncompressed file has a better chance in this battle against time. And what could be simpler than storing each film image as a still? Image Sequences aren't exactly new. Otherwise, chosing them as archival format wouldn't make much sense. All better editing programs can import image sequences and then treat them as video files. Indeed, some even allow progressive video files to be exported as image sequences .. but only, after they had already been compressed and that is precisely, what our process seeks to avoid! Every video file consists of contents and codec-specific information, which turns the images into moving pictures (the carts, wheels and rails). 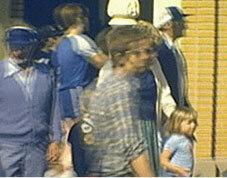 Our process, however, generates individual images from the raw data, before any video-codec has been applied. That means that - at the same overall volume - each image (container) can be less compressed and thus contain more information. As Bitmaps (TIFF and PNG would also be possible) the circa 30-thousand images contained in a 120m reel of film, would weigh in at around 200GB! Even the most powerful home computer would go to his knees under such a load. The solution is JPEG, a mature image format, which will still be readable decades from now. And since the JPEG compression scheme can be finely adjusted, it was possible, to find a sweet spot. At a negligible 5% JPEG compression, that same 120m reel weighs in at a svelte 10-12GB and can - irrespective of operating system and installed codec base - be edited and exported into any desired playback format. 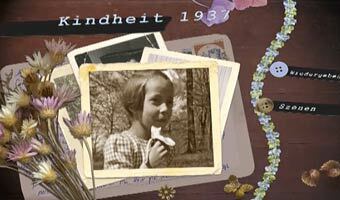 Since we are entering new land with this offer and in order to avoid anxieties, we are offering the Image Sequence option as Archiv-Set, i.e. together with a speed adjusted AVI. In other words, you receive two complete sets of data. Just call! These questions can best be dealt with in person. Distribute your films as freely as possible! Not just for safety's sake, but, to ensure the films actually get used! Even films, which have been edited before, can benefit from some judicial post production. Be it, to remove gremlins like a filter which had been left in place (problem was removed in a single step! ), or because back when the films were taken, one simply didn't like to throw anything away. Cutting, adding titles and music, rearranging scenes or creating presentations around a special theme, all these tasks are simple to achieve and are a lot of fun! All you need is a halfway decent processor, enough RAM and a good editing program! If you are already working with video, chances are, your current HD-ready program will do fine. All the popular choices, like Pinnacle or Magix have what it takes. If you don't have a program yet, or if you have a large film collection, it will be worth it, to invest in suitable software, because film has different characteristics to video. My personal favourite is Adobe Premiere Elements 9, which has finally overcome the stability problems, which had dogged Version 8. For around €90, you get APE in both, PC and Mac versions, which means that it can also fill the gap between iMovie (too dumbed down) and FinalCut Express! APE has a clear and intuitive interface and, coming from the creators of Photoshop, provides the simplest and most flexible colour and contrast adjustments, which often are the most important controls. Regardless of which program you decide on, I'll try and help you with your first steps. Just call.